We have seen time and time again that when our work for clean water faces challenges and threats, our Choose Clean Water members show up – and we show up in numbers. This was evident in 2017 when the president’s budget eliminated funding for the Chesapeake Bay Program and it was on display this week, when more than 100 members of the Coalition gathered on Capitol Hill to meet with members and staff in 40 different congressional offices. This year, we as a community are fighting not just for the funding we have had in the past, but what we need to meet new challenges to restore the rivers and streams in the Chesapeake Bay watershed. On March 6, the Coalition formally requested that Congress increase funding for the Chesapeake Bay restoration effort, specifically $90 million for the Environmental Protection Agency Chesapeake Bay Program, up from $73 million. This is the first time in five years that the Coalition has asked for increased funding and the request was met with much enthusiasm from our supporters on the Hill. In our letters to Congress requesting the increase in funding, we had 144 Coalition member organizations signed on, a record number of signatures. This show of commitment was a powerful tool during the congressional meetings. The biggest highlight of the day was our lunch briefing, where Coalition members, recipients of the Chesapeake Bay Program’s Small Watershed/Nutrient and Sediment Reduction Grants, funders, and members of Congress came together to discuss the state of the restoration effort and our commitment to pushing the effort forward. 11 legislators joined us, including Senator Cardin (D-MD), Senator Van Hollen (D-MD), Congressman McEachin (D-VA), Congressman Trone (D-MD), Congresswoman Luria (D-VA), Congressman Wittman (R-VA), Congressman Cartwright (D-PA), Congressman Ruppersberger (D-PA), Congressman Raskin (D-MD), Congressman Connolly (D-VA), and Congressman Cline (R-VA). All talked about their support for funding for Chesapeake Bay restoration and the important role that our Coalition plays in moving this effort forward. There are many reasons to ask for this increase, but two of them are climate change and the Conowingo Dam. When the Chesapeake Bay Blueprint was created in 2010, it was estimated that the Conowingo Dam would trap pollution through 2025. However, last year, new research determined that the reservoir behind the dam was actually full, and as a result more pollution was entering the Chesapeake Bay than had been originally accounted for. Now it is estimated that the Chesapeake Bay cleanup will need to reduce an additional 6 million pounds of nitrogen every year to mitigate water quality impacts from Conowingo. Also, the Chesapeake Bay region saw record amounts of rainfall this past year, resulting in increased flooding and runoff into local streams. These major rainfall events are only expected to increase with climate change, which will require on-the-ground pollution and flood reducing projects to adapt to new pressures. In addition to increased funding for the Chesapeake Bay Program, the Coalition is also asking Congress for a 50 percent increase in funding for the Chesapeake Bay Gateways and Trails Program and to fully fund the 2018 Farm Bill’s conservation programs to ensure responsible farms in the Chesapeake region remain economically viable. The Coalition is also requesting that Congress not ignore clean water issues when they put together a Federal Infrastructure Spending Package. The Coalition recommends tripling the funding for the Clean Water State Revolving Fund to $5 billion to be included in such an Infrastructure Package. This Fund provides low interest loans for sewage treatment and stormwater control upgrades and retrofits for local governments and ratepayers in every state. Congress and the Coalition are now waiting to hear from the Trump administration on the proposed FY20 budget and what it will say about our Chesapeake funding, but one thing is for sure, we will be ready to respond. You can see our sign on letters here. 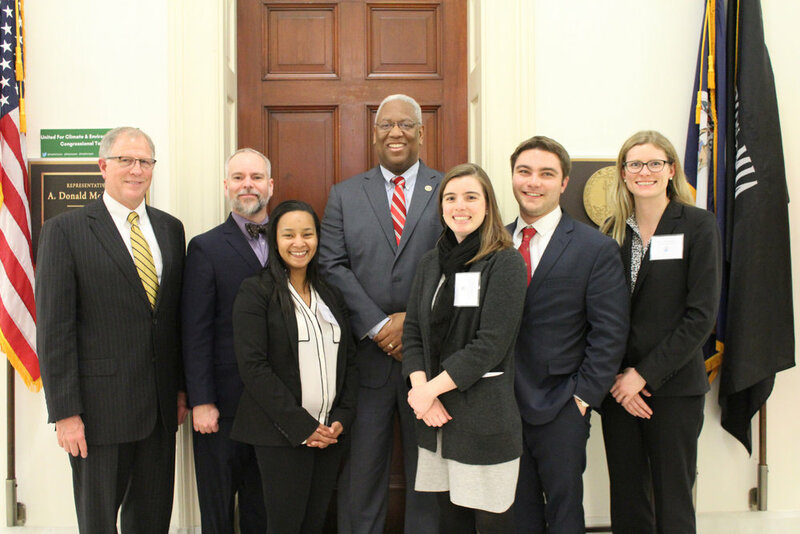 Congressman Donald McEachin (VA-04) met with our dedicated lobbyists. On March 21, more than 100 members of the National Wildlife Federation hosted Choose Clean Water Coalition and the Coalition for the Delaware River Watershed fought through a snowstorm to speak with their members of Congress about the importance of clean water. This was the 6th annual Chesapeake Bay Day on Capitol Hill for Choose Clean Water, a coalition of 239 nonprofit organizations focused on restoring and protecting clean water in the Chesapeake Bay watershed. Despite the snow, the Coalition met with more than 20 members of Congress or their staff, to discuss federal threats, like funding cuts to the Chesapeake Bay Program. Coalition members also had the pleasure of hearing from 10 different members of Congress at the Chesapeake Bay luncheon, including: Senator Chris Van Hollen (D-MD), Congressman John Faso (R-NY), Congressman Jamie Raskin (D-MD), Congressman Dutch Ruppersberger (D-MD), Congressman Don Beyer (D-VA), Congresswoman Barbara Comstock (R-VA), Congressman Gerry Connolly (D-VA), Congressman Don McEachin (D-VA), Congressman Bobby Scott (D-VA), and Congressman Rob Wittman (R-VA). The legislators spoke about life around the Chesapeake, where to find the best crab cakes, and of the future of clean water. The Coalition for the Delaware River Watershed simultaneously scheduled meetings with the entire congressional delegation that represents the Delaware watershed. The two Coalitions had joint meetings with a number of Congressional offices that represent both watersheds. Although the snowstorm disrupted several meetings, the tenor of those that did take place was overwhelmingly positive with congressional members pledging to champion the Delaware on Capitol Hill. The result of the Coalition’s two days on the Hill was a clear message to Members: fund the Delaware River Basin Conservation Act and its associated grant program the Delaware River Basin Restoration Program (DRBRP), a non-regulatory approach led by the US Fish and Wildlife Service. On March 23, the program received $5 million in funding as part of the fiscal year 2018 Omnibus spending bill approved by Congress. The Coalition for the Delaware River Watershed worked with Congress on the authorization of the Delaware River Basin Conservation Act in December 2016 that created the DRBRP, and through the newly funded program, money will finally begin flowing to local conservation projects throughout the region. Congressman Bobby Scott (VA-03) braved the snow to speak to us at lunch. The result of months of collaboration and hard work paid off with the rejection by Congress of Trump’s fiscal year 2018 budget proposal, which aimed to zero out the Chesapeake Bay Program. The spending bill that passed includes a fully funded Chesapeake Bay budget of $73 million and $5 million for the Delaware River. We owe a huge thank you to all of the members of Congress who voted in support of protecting the Chesapeake Bay and the Delaware River. The fight for clean water continues as the president’s proposed FY19 budget has only $7.3 million allocated for the Chesapeake Bay and nothing for the Delaware River. Want to help us keep robust funding for the Delaware and Chesapeake in FY19? Tell your elected officials that you demand clean water for this generation and generations yet to come. Mary Katherine Sullivan is an intern with the Choose Clean Water Coalition. Since 2015, the Environmental Protection Agency's Chesapeake Bay Program has received $73 million in funding for the restoration effort. It is often said that this funding goes to "on the ground restoration efforts around the Chesapeake Bay watershed that are improving local communities." This is true, as the Bay Budget not only supports those who are managing the restoration effort, but projects that are having a positive impact on the Chesapeake Bay's rivers and streams. But what exactly does spending the Chesapeake Bay Budget look like? Our chart below lists the seven jurisdictions of the Bay region and how much each jurisdiction was granted through the Bay Budget in 2017. When breaking down the Chesapeake Bay Budget from FY2017, we are able to see that most funding goes directly to the states for on the ground restoration projects. As you can see, more than a third of the $72 million in funding given to the Chesapeake Bay Program is then put back into the Bay states. This helps support local nonprofits and businesses, and improves communities. This is one of the reasons why ensuring continued funding for the Chesapeake Bay restoration effort receives so much support from members of Congress - people understand the benefits and can see the results in person. In 2017, Maryland received more than $13 million in funding for projects that include installing buffers and restoring wetlands to reduce non-point source runoff and improving oyster restoration locations. In 2017, Pennsylvania received $11 million in funding, going towards projects like the protection of critical habitat and manure management. Virginia used a portion of its $11.5 million in funding last year to support oyster restoration in the Lafayette River, stream restoration design in Shenandoah County, and the installation of stormwater best management practices. D.C. received more than $3 million, which went towards projects like Fort DuPont watershed restoration and stormwater management systems in the Anacostia River watershed. Last year, Delaware received $2.8 million that was used to fund projects on accelerating wetland restoration and reducing phosphorus with thermochemical conversion. In 2017, West Virginia used its $2.9 million to work on projects like building a conservation hub in the Potomac River headwaters, restoring trout habitat, and monitoring the Appalachian watershed. New York was granted $3.3 million and put that amount towards funding projects like low-cost methods for forested buffer plantings and reconnecting floodplains through streamside berm removal. According to the National Oceanic and Atmospheric Administration, the commercial seafood industry in Maryland and Virginia contributes $3.39 billion to the local economy per year. However, the Secretary of the Department of the Interior, Ryan Zinke, believes that this is not significant enough to exclude these states from offshore drilling. The proposal regarding offshore drilling presents an insurmountable threat to the east coast and especially the Chesapeake Bay. Blue crabs and striped bass are just two of many species that could be heavily impacted by offshore drilling – especially if there were a spill. 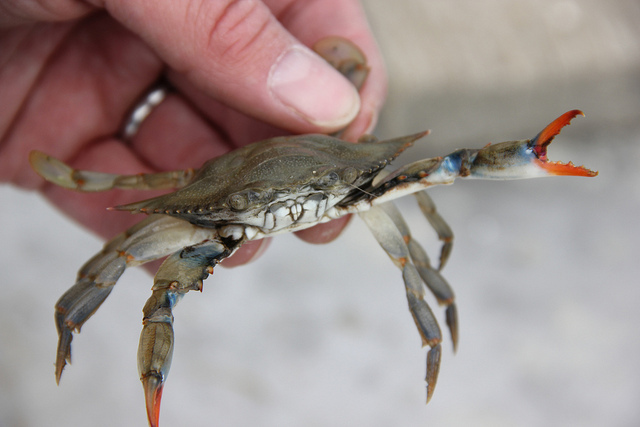 In the past, offshore drilling caused major complications for blue crabs. Three years after the disastrous 2010 Louisiana oil spill, the crabs living in the Gulf were still severely altered. Many fishermen reported that they were pulling up empty crab nets day after day. Even worse, the small amount of crabs caught commonly had no claws, points were burned off, and some had severe shell deformities. Dispersant, a chemical used to break down oil droplets, brought its own challenges for crabs after the oil spill. These toxic components were found in crab shells and many were killed as a result. Could you imagine this happening to our blue crabs? But how would offshore drilling in the Atlantic impact our Chesapeake critters? In the beginning of their lifecycle, blue crabs hatch into larvae where they are transported into the ocean. They grow, feed and molt in this area and the mouth of the bay from June to September. Another iconic bay species, striped bass, live throughout the Chesapeake Bay and its tributaries, but part of their life cycle also includes returning to the ocean after they spawn. If an oil spill occurred in the ocean during these critical points, a year class of these species could be compromised. Blue crabs and striped bass are not only ecologically important but they have a huge economic value. Every year, Chesapeake Bay watermen provide approximately a third of the nation’s crabs and striped bass bring in approximately $500 million from activities related to fishing. Clearly, offshore drilling’s threats would be devastating and widespread. Offshore drilling brings extreme threats to the Chesapeake Bay and everyone connected to it. Not only is it important for us to safeguard the bay for everyone now, but for future generations too. We can’t jeopardize the Chesapeake Bay, its wildlife, jobs, tourism, economic benefits and beauty on something that is so dangerous. This is why the Choose Clean Water Coalition submitted a sign-on letter to express our concerns to Secretary Zinke. Over 50 organizations signed this letter to show support in opposition to offshore drilling and our members plan to discuss this issue further with our members of Congress during our Chesapeake Bay Day on Capitol Hill. It is important to remember the ocean and the bay are connected as a vital system, which provides a habitat for blue crabs and striped bass. Anything that happens in the ocean will eventually impact the bay and vice versa. We must say ‘no’ to offshore drilling to make sure no species are harmed during critical times in their lifecycle. Taylor Stark is an intern with the Choose Clean Water Coalition. The Coalition would like to give a shout out to our senior Senator from Maryland – “Way to go Senator Cardin!” Most people are well aware of Senator Cardin’s leadership on environmental issues- fighting to increase funding and protections for Chesapeake Bay, and over the past year fighting to protect the funding and the gains we have made. What many people do not know, however, are all of the significant things that Senator Cardin does for the Bay, and for the community of people who have spent their lives, or part of them, working to restore our national treasure. A few weeks after the election in 2016, Senator Cardin organized a gathering of a large group of environmental professionals in Annapolis to have an open discussion about what the results of that election would mean for the Bay. The one clear message from that meeting was that Senator Cardin would be there for all of us to fight for the Bay and for the bedrock laws and institutions that have been responsible for our environmental progress over the decades. 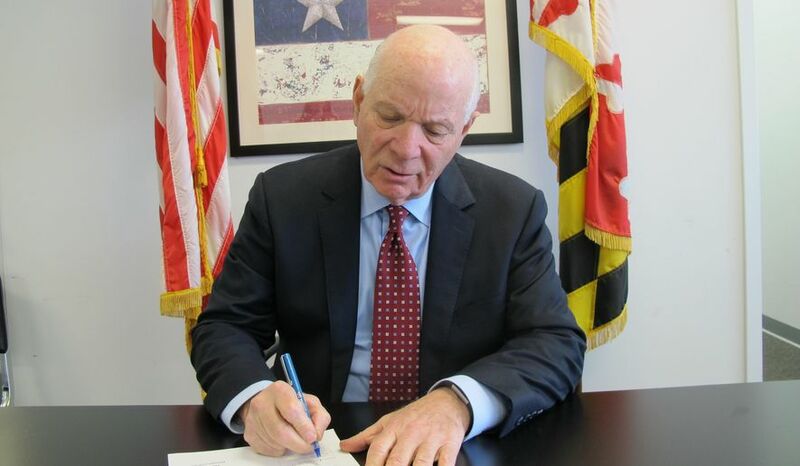 Senator Cardin has kept his word, and he has been there for our community. From continuing level funding for Bay restoration to his most recent action to ensure that the cooperative federal-state partnership that has led and coordinated the 35 year old Chesapeake Bay restoration program was not dismantled. Most people have been totally unaware that there was a very serious effort to move the EPA Chesapeake Bay Program Office complex from Annapolis to be behind the security gates at Ft. Meade. Other members of the Bay delegation, including Senator Chris Van Hollen, also helped with this effort. The simple move itself seems benign, until you realize that over the decades, numerous Federal agencies have been moving offices and personnel to be near the Chesapeake Bay Program in order to coordinate and collaborate on programs, projects and actions. All of this occurs within the Chesapeake Bay Program that has regular meetings open to the public – from universities to environmental groups to industry and to the general public. Those open public meetings would have been a thing of the past, with the high level of security required to even step onto Ft. Meade. Just this week EPA announced that the Chesapeake Bay Program would be staying together in Annapolis, and would remain an open and inclusive program for the public and all stakeholders. Most people did not even know there was a problem that was solved, so we would like to thank Senator Cardin for his leadership and effort on this critical matter. Thank you, Senator! Peter Marx is the federal affairs contractor at the Choose Clean Water Coalition. Say someone asks you to imagine the quintessential law student. What kind of individual comes to mind? Be it positive or negative, based on stereotype or personal experience, there is something that virtually every law student shares in common: an inquisitive nature and a desire to learn. As a current law student, I can assure you that this trait is common across the board. As an intern with the Choose Clean Water Coalition this semester, I guarantee you that there are few better opportunities for get-your-feet-wet-and-hands-dirty-style learning than the Chesapeake Bay Day on Capitol Hill. 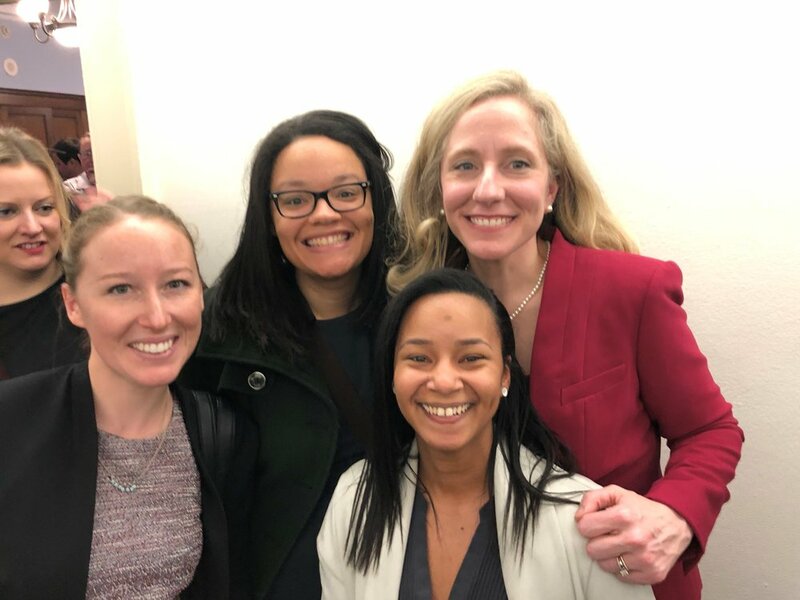 Chesapeake Bay Day on Capitol Hill, affectionately and efficiently known as “Lobby Day” among Coalition members, was nothing short of a masterclass in how positive results stem directly from seamless organization and relentless adherence to a common message. Lobby Day consisted of over 60 Coalition members from all across the Chesapeake Bay Watershed joining together in Washington, D.C. to lobby directly with elected representatives on behalf of clean water legislation and funding. In over 37 separate meetings with both House and Senate members and staff, the Coalition made its case for an impressive and important set of initiatives. “Asks” were made on behalf of level funding for the EPA Chesapeake Bay Program, Chesapeake Small Watershed Grants, Innovative Nutrient and Sediment Reduction Grants, and adequate funding for the Clean Water State Revolving Fund in Fiscal Year 2017. Additionally, Members of Congress were asked to urge the USDA to increase the Regional Conservation Partnership Program funding for the Chesapeake region. We are listed as a priority, but have not received “priority” funding for some time. If all of that seems daunting to you, I can assure you it is. 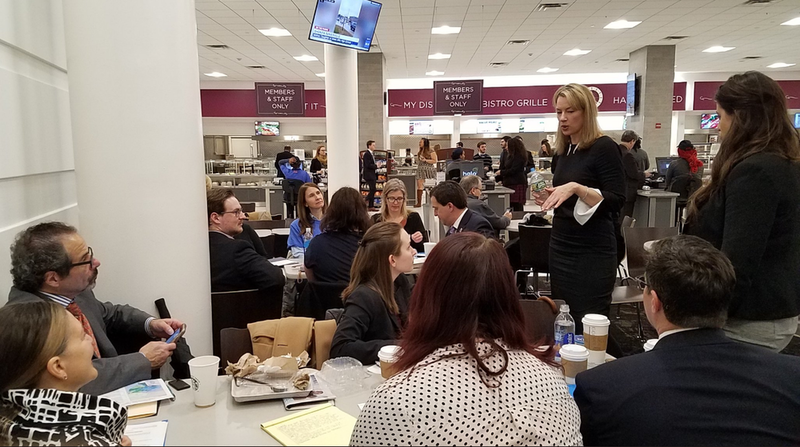 In today’s political climate, when meaningful and impactful change seems to stall, Lobby Day is an extraordinary example of the process working like a well-oiled machine. There we were up on the Hill, all of us equipped with our commitment to cleaner water, zig-zagging from Senate side to House side (through the biting cold and wind, mind you) making ourselves seen and heard and holding our elected officials accountable. Particularly remarkable was the warm reception we received. Granted, my meetings with the staff of Senator Mikulski, and Representatives Edwards, Cummings, and Sarbanes weren’t particularly tough sells. They have all demonstrated a consistent commitment to clean water during their respective tenures in office. But it wasn’t uncommon for the representatives and their staff to thank us—their constituents—for our tireless efforts on the front lines for the environment. It was wonderful and it was humbling. Law school has a tendency to tunnel one’s vision just a bit. As students, we spend a majority of our time with our noses buried firmly in casebooks, awaiting our next assignment or exam. When you spend so much time in the classroom, it’s not hard to lose perspective on the reason we came back to school in the first place. Lobby Day was a wonderful reminder. I can read about governance for hours in my Constitutional Law class, debating doctrine and arguing how the law should or should not have progressed. But seeing governance in action and participating in the legislative process in real time—that is a horse of a different color. On June 16, 2014, a brand-new Chesapeake Bay Watershed Agreement was signed in order to establish goals and outcomes for the restoration of the Bay. Since the signing of the Watershed Agreement, the Bay Program’s Goal Implementation Teams have been constructing Management Strategies in order to outline the necessary steps to achieve the Agreement’s objectives. The Management Strategies cover various restoration programs and are supported with two-year work plans, including specific commitments, in order to reach the 2025 goals outlined in the Agreement.